Take a scenic ride from Philipsburg to Grand Case with this 5-hour shuttle tour. Combine some sightseeing with a convenient ride to St. Maarten's gourmet capital, where you can take your pick of fantastic restaurants in which to dine. Departures available at 6pm or 7:30pm. Get dressed for dinner and make it down to your hotel lobby in time for your convenient pickup at either 6pm or 7:30pm. Skip the hassle of trying to find a taxi and simply climb into your prebooked shuttle, find a comfortable seat, and relax on the drive from Philipsburg to Grand Case. Drive the eastern route or the western route, both with a couple of photo stops and views over the respective coasts of the island. 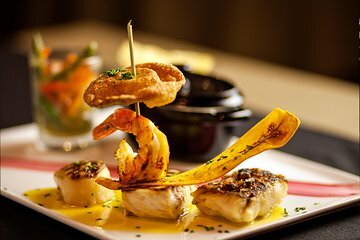 Once you arrive in Grand Case, take your pick of restaurants featuring oceanside dining and Creole, tapas, Italian, French, or other types of cuisine. Every Tuesday features Harmony Nights, a street fair with a carnival atmosphere. Return shuttles are available at 9pm, 10:15pm, or 11:15pm.